Didier Champion – My thougts about Rwanda and Africa today and tomorrow. On the 25th commemoration of genocide against Tutsi in Rwanda, President Paul Kagame delivered a very powerful message to the people of Rwanda. His message highlighted the recovery of Rwanda, and it took me back through the journey that we have been on for the past 25 years after 1994. The message is crystal clear that Rwanda is here to stay. However, We Rwandans have to be protective of what we have built. The unity, peace, and reconciliation pillars are the foundation of Rwanda today. As the youth of Rwanda, We have to stay engaged and be proactive in our nation’s building. This is why I am sharing his speech for those who might have missed it. It is a roadmap of where we are heading as a nation and the challenges ahead for Rwanda. I begin by thanking you. On a day like this, when language fails, the first words that come, are words of gratitude. To you, the friends by our side on this heavy day, including the different leaders present, we say thank you. Many of you have been with us all along, and we cherish you for contributing to the healing and re-building of Rwanda. Sisters became mothers. Neighbors became uncles. Strangers became friends. Our culture naturally creates new bonds of solidarity, which both console and renew. 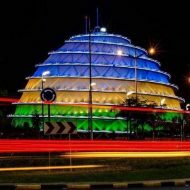 Rwanda is a family. That is why we still exist, despite all we have gone through. There is no way to fully comprehend the loneliness and anger of survivors. And yet, over and over again, we have asked them to make the sacrifices necessary to give our nation new life. Emotions had to be put in a box. Someone once asked me why we keep burdening survivors with the responsibility for our healing. It was a painful question, but I realized the answer was obvious. Survivors are the only ones with something left to give: their forgiveness. Mature trees can no longer be molded, but seeds contain endless possibility. Rwanda’s young people have everything needed to transform our country. They have the responsibility to take charge more and more, and participate fully in securing the Rwanda we want and deserve. As for the dishonorable who remain impervious to regret, it is not our problem. It does not stop Rwanda from making progress, even for one moment. Never accept it. Confront the apostles of division and hatred who masquerade as saviors and democrats. Our commonalities are always infinitely greater than our differences. No society is above any other, much less immune to fragility. Garcia, a general in Cuba, who is familiar with the Spaniard combat tactics. He could possibly help with some valuable details on how to win against Spain. Rowan, an American trusted to go to Cuba and find Garcia. At this time, no telephone or any means of communication available to contact Garcia. Rowan has to deliver the letter to Garcia, in person. Once delivered, Rowan has to inform his boss that he has accomplished the task. At the time, Garcia’s location is unknown, and Rowan has to do all the work by himself. Pack up the bags and go to a new country, looking for an individual he is never met. He took up the task and delivered the letter, just in time. His courage and sacrifice are amazing. Whatever your job or profession, strive to be the ” Rowan”. Can your employer trust you to do the job? especially during “crunch time”. Are you reliable and dependable that your supervisor can give you impossible tasks, knowing that you will achieve the desired results? This text describes a story of a man named Rowan who was trusted by his supervisor as the only person who was qualified enough to get the message to Garcia. The letter addressed to Garcia himself had to be delivered to him in person. Rowan had to inform his supervisor that he had accomplished the mission. The only problem was that no one knew where Garcia was at the time, and the message was urgent enough that it had to get to him in a timely manner before it was too late. This was during the Spanish-American war and it was important to communicate with Cuba, as Spain had lots of influence in Cuba at during those times. The important lesson learned from this text is that we have to be like Rowan in our service as soldiers. We need to be as focused as Rowan was, along with concentration, determination, and perseverance to be excellent soldiers. These qualities will definitely help us when we are on and off duty in the military or civilian life. When Rowan was given the letter, he did not complain and give excuses for why he might not be able to get the letter to Garcia. He simply took it and went to Cuba looking and searching for Garcia until he delivered the letter. As soldiers, we have to adapt and be flexible enough so that whatever tasks that need to get done have to get finished without excuses and complaints. We, as individual soldiers in our respective MOSs, must work together so that our units excel in our jobs. That way we can be trusted by our NCOs and commanders to perform difficult tasks and accomplish the mission in our [insert your Battalion name] and [insert your brigade ] in general. I have been told to summarize this essay by my NCOs for the 3rd time now in less than two years of my career. I am not sure if this is the only essay the military has available, but it is a powerful essay. I am sharing this summary for folks out there who might need some help. The original text is kind of confusing first. You will have to read it twice to understand it because it is written in some archaic English. If you decide to use my summary, make sure to give me credit and do not just copy and paste. Hopefully, you find it helpful. Cheers! The proposal in action. At the top of Bisoke Volcano with crater late at 12, 200ft of altitude. A little over two months ago, I proposed to my then girlfriend and she responded me a BIG YES. This is valentine’s day is our first valentine’s day as an engaged couple. It was one of the greatest emotion I have ever had for sure. I was very relieved to get that ” YES”. After all, there is no greater feeling knowing than getting that “Yes, I will marry you” response. It was one of the best memorable moments of my life. The whole process and preparation were not easy, but I was very relieved and satisfied in the end. My efforts did really pay off big time. My fiancee and I are very grateful. Ever since we met, we fell in love with each other. We are very thankful that each one of us found their soulmate, their better half. No greater feeling than that. I had been planning this engagement for 3–4 months. We both like to go on crazy adventures and are very big on outdoor activities. So, when I was thinking about proposing to her, I thought about something that would blow her mind and at the same time make me very happy. We live on two different sides of the world, so we don’t see each other as often as we would like to. We love each other very much and have been dating for years now. We had been talking about marriage, and other related stuff! So I knew it was time to propose to her, but I wanted to impress and surprise her in the best way possible I could! She loves surprises! Proposing to her on top of a volcano with an amazing view was very hard to pull off. I was very fortunate that everything went well. Top of the Bisoke Volcano in our home country of Rwanda at 3,711 meters ( 12, 200 ft). We are both physically fit, but I was not sure if she was going to make it to the top. Even though, I have climbed a few other mountains in Colorado; for her, this was her very first one. If either one of us could not make it, there is no way, it would have happened. I would have had to settle for Plan B. We had been planning this hike for some time, but of course, she had no idea that I was planning something more. This past summer I asked her about her ring size. But the measurement they gave her back home in Rwanda was a bit different as I had to order her ring on American and UK website. It took me a good week to finally match her size, cross-referencing different measurement techniques and standards from different countries. Before starting the hike, our tour guide gave us a lengthy safety briefing about all of the precautions. We were told that many people do not make to the top. That they get tired and give up. We were also told that a few people have lost their lives, lacking oxygen and breath, from various health issues. We got lucky the weather was very nice to us and it did not rain. Otherwise, it would have been even terrible. On a typical good day, the hike takes 2.5–3 hours to get to the top, and another 2–3 hours depending on the physical fitness of hikers. However, we were determined to make it and did not back out. Three quarters through the hike, I started thinking about plan B just in case one of us could not make it. I was going to propose wherever we were going to stop our hike. I was very happy I did not need plan B. We both made it to the peak of the volcano at 3, 711 meters (12, 200 ft ) and got to see the crater lake that we both wanted to see so bad. Long story short, it took us 3 hours to get to the top, one hour to rest, eat, and relax at the top and another 3 hours to come back down. My photo after finishing a 6-hour total hike up and down the mountain. The greatest feeling was that everything went well, from A to Z. She said YES. We made it to the top and back, in record time. The ring fits her well and she loves it. And now, we are happily engaged. My Friends, I have had some good feelings, but nothing comes close to finally knowing that you are going to live with your best friend forever. For my fellow men out there, I wish you the best proposing to your partner someday. It is one of the best feelings you ever going to have in your life. Make it count and don’t settle for the easiest proposal idea. It does not have to be expensive, but make it creative and interesting. Surprise and give her one of the stories she is ever going to tell to her friends. It is so worth it, trust me. Best of luck.